Although Jainism was patronized and followed by Rashtrakoot sovereigns but Jainism was not confined to a particular imperial dynasty. Jainism was popular among laity in North east Karnataka region during medieval centuries. Chalukyas of Kalyani, Silahaars and Gangas also contributed to Jainism by construction, renovation of pantheons of Jina savior, patronization to Jaina poets –authors and endowment to Jaina monasteries. Such ancient Jain sites are visible today in modern Gulbarga, Yadgir, Bedar, Latur, Osmanabaad and Bellary districts of Karnataka and Maharashtra state. It is evident from inscriptions, paleography and literary sources that Gulbarga region was center of Jainism during 8th to 13th century AD. Sedam :- Sedam is situated in Gulbarga district of Karnataka state. Sedam is situated about 15 Kilometers apart in east direction from Malkhed town and about 55 kilometers apart in south east direction from Gulberga district headquarters. Although sedam is not much far from ancient capital of Rashtrakootas but no evidences are available in modern time to relate the place from Rashtrkootas from Jainism point of view. Most of pantheons, sculptures and inscriptional sources are hailed from Kalyani Chalukyan era in sedam. Temples of Sedam :-According to literature there were three temples in the town which are hailed from 11 -12th century AD. Two of these temples were situated at Settiyara oni (Merchants Quarter) and one is situated at potter’s colony. Initially these were in desolate condition and people used the temple as store of cattle fodder and cow dung. Sedam has a temple in the middle of the town in old town; moreover the basadi is a masterpiece of Chalukyan Architecture. The temple is situated in narrow passages of the old town. The temple has principal deity of Lord Parshwanatha which is hailed from Chalukyan Kalyani era. The temple has entrance which resembles to a home entrance and condition of the temple is not up to the mark. Most of artifacts and crafts of ancient temple are used in renovation of the temple. The Temple’s main entrance is flanked by two ancient Kannada Inscriptions which are incised on a big stone slabs. These inscriptions are inscribed in archaic Kannada and written about in 70 lines in the eulogy of Jina , pontiffs, Preachers and Chalukya sovereigns. The temple entrance leads us to porch which contains garbhagriha and several vedis containing Jina sculptures. The principal deity is Lord Parshwanatha which is delineated in Kayotsarga posture has about height of about 3 to 3.5 feet sculpted in Black stone. The principal deity is a masterpiece of Chalukyan art containing triple canopy, Whisks and attendant subordinate deities. Inner garbhagriha entrance is decorated with carvings in the form of kudus, attendant deities and celestial god-goddess. Outside of garbha griha there are a yakshi sculpture is installed and some other white stone ancient sculptures delineated in padmasana posture are installed. The temple has some other excellent masterpieces of Chalykyan art which are teerthankar sculptures in Kayotsarga and padmasana posture as well as yakshi sculptures. Two yakshi sculptures perhaps Ambika and Jawalamalini are depicted in temple which are hailed from 11th 12 century AD. Both the images are depicted in tribhang situation and carved very artistically. Ambika is depicted with two hands and Jawalamalini are depicted with four hands. Moreover the temple has a great ceiling structure which reminds us the carving of kamal basti Belgaum. The ceiling carving contains Jina saviors, celestial god-goddess, kudus, Simha mukhas and a lotus styled central portion which seems very beautiful. One kayotasarga Jina sculptures and two padmasana Parshwanatha sculptures are also very mesmeric. Inscriptions of Sedam :- Sedam town was anciently renowned as Sedimba which is evident by inscriptions found from this site. There are about 6 inscriptions found from this place which was first highlighted by Scholar P.B. Desai in his book Jainism in south India and some Jain epigraphs He illustrated these inscriptions very thoroughly enlightening on each aspect like art, history rituals and customs of Jain laymen and Chalukyan sovereigns. An inscription found from temple situated at settiyara oni records information about Loka Jinalaya which is clear indication to a Jain temple but this temple is not in existence presently, moreover it is surmised that the temple Loka Jinalaya must had been constructed by Loka of Haihaya family. 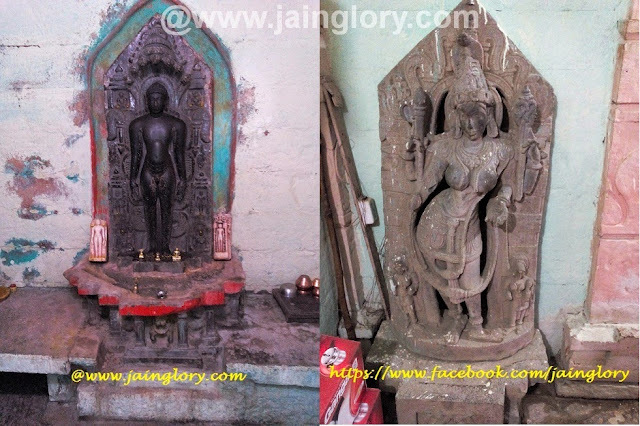 Besides the image of Parshwanatha in chikka basadi, a few mutilated sculptures of Jina saviors were found by the side of well situated at settiyara oni. An inscription found from temple situated at settiyara oni records information about 300 merchants who endowed to construct the Shantinatha Jinalaya which was also known as Brahma Jinalaya. The inscription has record of Preacher Trividya Prabhachandra Bhattaraka who was superintendent of holy place of Virapura and belonged to Maduva gana. The inscription should be hailed from 24th Jan. 1124 under sovereignty of Tribhuvanmalladeva Vikrmaditya VI of Kalyani chalukyan Clan. An inscription hailed from 1138 AD found in a temple situated at potter’s colony. The inscription was contemporary to Chalukyan King Bhulokmalladeva or Someshwara III. The date assignable to him should be in between 1126 to 1138 AD. An inscription hailed from 1158 AD under sovereignty of Someshwara IV found from Temple situated in potter’s colony. The inscription is of later date than inscriptions found from settiyara’s oni temple. The inscription has a fabulous record of Jwalamalini Cult which was prevalent in Karnataka and Tamilnadu. Jawalamalini Stotra was composed by Indranandi at Malkhed. Exorcising rituals were performed by laymen in honor of Jawalamalini at Sedam and the town was a holy seat of Yapniya sangha. Goddess Sedimba of this town was none other than Jawalini wearing golden ear rings.